Eagle, Idaho — February, 2016 —UCLEAR Digital announces the release of The Pulse Series Drop-In Speakers. The Pulse Series is offered in three models: Pulse, Pulse Plus and Pulse Pro. The Pulse Series adds Hi-definition audio to just about any helmet with their universal fit. The Pulse is a direct audio upgrade for many helmet communication systems, audio devices or Smartphones with a standard gold plated 3.5mm audio jack. The Pulse Plus model adds an in-line audio controller and microphone for phone call use and fingertip control over your audio device. The Pulse Pro uses the same Hi-Fi speakers as Pulse and Pulse Plus but incorporates our UCLEAR Digital USB plug. The Pulse Pro is a direct upgrade for our HBC100 Plus and HBC200 Force Helmet Communication Systems.. 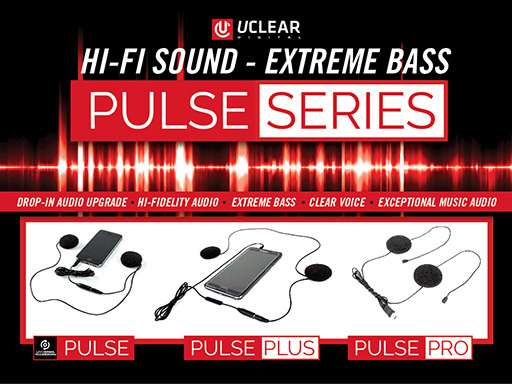 If you are looking for the industry’s best sound; then look no further than the Pulse series. The Pulse Series adds crisp clean sound, Extreme Bass, Unsurpassed music quality to any helmet. Drop-in the Pulse Speakers; your ears will thank you!